Some iPhone games are fascinatingly complex, and require hours of play to truly appreciate. Some games are simple enough to play while you’re waiting in line at the store – but you end up playing them for hours anyway. Traffic Panic, a free offering by Neon Play, is one of the latter: you jump right in, get into a groove, and get addicted. 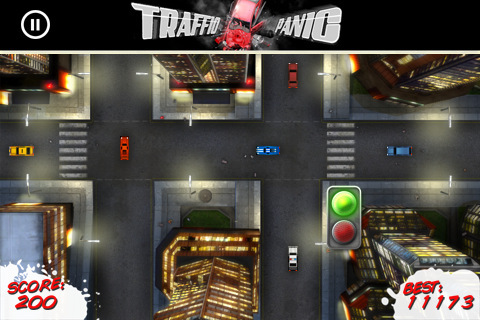 Your mission in Traffic Panic is straightforward: “Don’t crash or cause traffic jams.” The details of gameplay are easy to pick up: you control one traffic light, and tapping anywhere on the screen switches it between red and green. Each vehicle that you guide through the intersection earns you between 10 and 200 points. The game doesn’t explain how point values are determined, but it appears to be related to the car’s wait time at a red light. Cars that don’t stop earn the full 200. It’s not as nice and orderly as you might think: you only control the light for one street, and cross traffic never stops. You can’t always play it safe and wait for traffic to clear, either: the more cars you have waiting, the harder it is to get them all across without crashing. If you manage to back up traffic to the end of the screen, that’s the “traffic jam” the game warned you about, and you will lose. Keeping things moving requires fast action and excellent timing. The graphics are clean and crisp, and the app runs smoothly. I love the music – a simple, funky riff that feels laid-back, not panicky. The developers could have easily changed the feel of the game with a higher-energy tune, but the relaxed music is a wise decision. The app is free, but only one level is available at first. Unlocking subsequent levels requires coins, which you can either earn in-game at the rate of one coin per 1,000 points scored, or purchase for a small fee. If you like the game, though, you’ll quickly rack up the coins. My only complaint is the omnipresent ad banner at the top of the screen. I’ll tolerate a small amount of advertising as a necessary evil, but the ad placement remains during game play. The game requires a certain level of focus, and the periodically rotating ads can be distracting. If Traffic Panic ran ads only on its menu and options screens, the experience would be significantly improved. 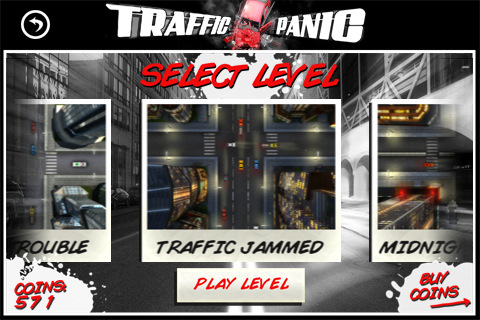 Even with the annoying ads, Traffic Panic is still worth a download on your iPhone or iPod touch. It should take you two minutes to figure out if you like the game. If you do, those minutes will quickly become hours. AppSafari review of Traffic Panic was written by Katherine Thorne on February 19th, 2011 and categorized under App Store, Free, Games, Resource Management. Page viewed 5875 times, 2 so far today. Need help on using these apps? Please read the Help Page. is it free? because it doesn’t diserve to be paying. I love this game and the funky music.